This portal has a single page layout. Any subpages are likely no longer needed. French Polynesia (/ˈfrɛntʃ pɒlɪˈniːʒə/ ( listen); French: Polynésie française [pɔlinezi fʁɑ̃sɛːz]; Tahitian: Pōrīnetia Farāni) is an overseas collectivity of the French Republic and the only overseas country of France. It is composed of 118 geographically dispersed islands and atolls stretching over an expanse of more than 2,000 kilometres (1,200 mi) in the South Pacific Ocean. Its total land area is 4,167 square kilometres (1,609 sq mi). French Polynesia is divided into five groups of islands: the Society Islands archipelago, composed of the Windward Islands and the Leeward Islands; the Tuamotu Archipelago; the Gambier Islands; the Marquesas Islands; and the Austral Islands. Among its 118 islands and atolls, 67 are inhabited. Tahiti, which is located within the Society Islands, is the most populous island, having close to 69% of the population of French Polynesia . Papeete, located on Tahiti, is the capital. Although not an integral part of its territory, Clipperton Island was administered from French Polynesia until 2007. Polynesians are an ethnolinguistic group of closely related peoples who are native to Polynesia (Polynesian Triangle), an expansive region of Oceania in the Pacific Ocean. They are part of the larger Austronesian ethnolinguistic group who trace their urheimat to Southeast Asia. They speak the Polynesian languages, a branch of the Oceanic subfamily of the Austronesian language family. 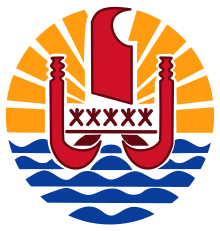 The Assembly of French Polynesia (French: Assemblée de la Polynésie française, Tahitian: Te âpooraa rahi o te fenua Māòhi) is the unicameral legislature of French Polynesia, an overseas country of the French Republic. It is located at Place Tarahoi in Papeete, Tahiti. It was established in its current form in 1996 although a Tahitian Assembly was first created in 1824. It consists of 57 members who are elected by popular vote for five years; the electoral system is based upon proportional representation in six multi-seat constituencies. Every constituency is represented by at least three representatives. Since 2001, the parity bill binds that the number of women matches the number of men elected to the Assembly. This is a list of airports in French Polynesia, sorted by location. This article lists political parties in French Polynesia. The Bombardment of Papeete occurred in French Polynesia when German warships attacked on 22 September 1914, during World War I. The German armoured cruisers SMS Scharnhorst and Gneisenau entered the port of Papeete on the island of Tahiti and sank the French gunboat Zélée and freighter Walküre before bombarding the town's fortifications. French shore batteries and a gunboat resisted the German intrusion, but were greatly outgunned. The main German objective was to seize the coal piles stored on the island, but these were destroyed by the French at the start of the action. ... that Missionary Day, celebrated on 5 March in French Polynesia, commemorates the 1797 arrival of the Protestant missionaries in Tahiti aboard the Duff? ... that The Church of Jesus Christ of Latter-day Saints opened its first foreign-speaking mission in French Polynesia? Do you have a question about French Polynesia that you can't find the answer to? Consider asking it at the Wikipedia reference desk. For editor resources and to collaborate with other editors on improving Wikipedia's French Polynesia-related articles, see WikiProject French Polynesia. High Commission of the French Fifth Republic. The Assembly of French Polynesia. A two-franc World War II emergency-issue banknote (1943), printed in Papeete, and depicting the outline of Tahiti on the reverse. Va'a (traditional Polynesian outrigger canoe) during the Hawaiki Nui Va'a race. The French frigate Floréal in November 2002, stationed in Bora Bora lagoon.